Cellulite? So not cool. 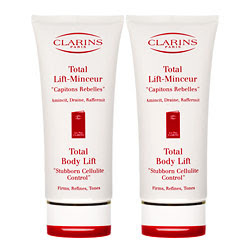 And to refrain from getting that horrible stuff all over my thighs, I definitely want to turn to the Clarins Total Body Lift Double Edition. This cream gets rid of cellulite easier, better and faster than anything else I've tried. I've been a fan of this cream ever since I got the Clarins Ultimate Body Lift treatment at the Clarins Skin Spa earlier this year. The treatment utilized this cream to ensure smoother, softer, more radiant skin. My entire body literally glowed after only a few minutes being massaged with the stuff. I really can't say enough good things about this cream. It's thick and moisturizing, rich and nourishing, lush and conditioning. My skin just feels silky and lustrous after each and every use.